It took us a while to locate this circle. As we walked down the track to the northwest we could see the circle across the fields, but decided it may be better to approach from the southeast. We were wrong - two high field walls blocked our way. Our first instinct was right. The top and bottom shots were taken over the wall. 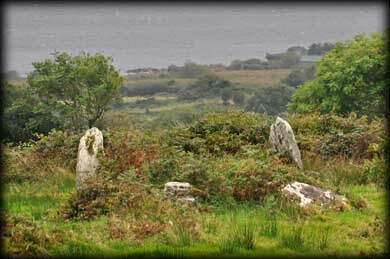 The circle is badly overgrown and some of the stones have fallen. It appears to be a recumbent stone circle. In the image below the low stone in the centre is probably the axial stone with two flankers. 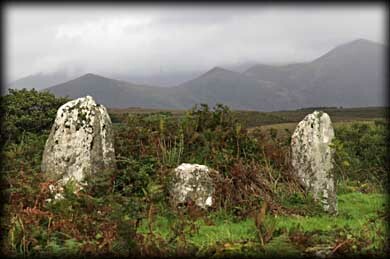 The picture left may show the flankers in the background with the two fallen portal stones in the foreground. In the hedgerow to the north is an outlier. Situated: From Waterville on the N70 turn north at the Beachcove Cafe, go by the Post Office. Drive straight for 5.6 kilometres. Stop at the track on your right. Walk down passed the second field on your right. Go right through the gate. Walk to end of the track. you should see the circle. Discovery Map 83: V 5437 6930. Last visit Sept 2012.